09.12.2012 Manchester, England. 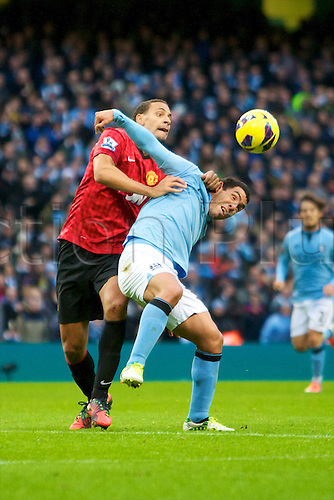 Manchester City's Argentinean forward Carlos Tévez and Manchester United's English defender Rio Ferdinand in action during the Premier League game between Manchester City and Manchester United from the Etihad Stadium. Manchester United scored a late winner to take the game 2-3. Editorial: No 3rd party distribution outside your specific licensed territory. Usage for internet media exclusively for holders of Football DataCo Licence.